PokerTimer is an easy to understand tournament management software that's a simple way to make your home game feel like a real casino tournament. A Pro version allows you to install an application right on your computer so that you're not dependent on having constant internet access. A large display and fully customizable tools make this program a must for every home game. 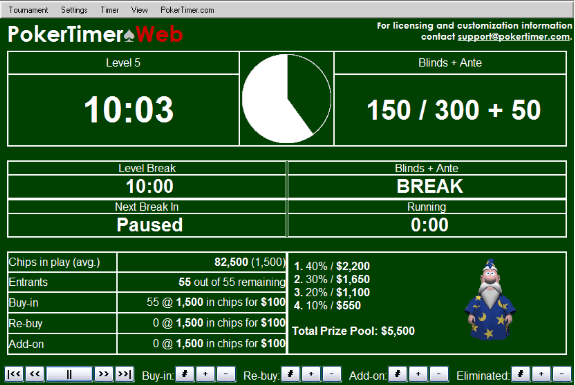 The beauty of PokerTimer is that it’s easy to use. You can literally set up a home game in several minutes. The main display features the tournament clock, current blind levels, upcoming blind level, the number of players remaining, the prize pool, the payouts, and easy CD player-like controls that make navigating the program simple. A full array of audio clips helps prompt play, but make sure you’re using Internet Explorer, as they don’t work with Firefox or any of the other web browsers. You can also adjust the prize payouts, number of places paid out, and even the entire look and feel of the program itself. Its ease of use makes running a home actually pretty fun and can greatly enhance the look and feel of your living room!